This past weekend Vicki told me that she was going to see her Dad again. She was going to drive over on Saturday morning and then come back that afternoon. It was going to be a quick trip. Because of the projected winds that were to blow and the fires that had been taking place, especially the one over by Shamrock, I went with her. Although the wind was blowing on the way over, it was the trip home that was tough. Vicki drove for a bit coming home, but when she went to pass the trucks on I-40 it scared her. They were weaving back and forth across the road and she just didn’t know how to handle it. The gusts of wind made it worse. When we crossed over into Texas, it seemed to be more difficult. There was a fire burning up south of Wheeler and the smoke was boiling over us and turned the sky a weird looking orange. All I could do at this point was keep my eyes on the road and move forward. When we got out east of Shamrock where the fire had been it was really tough. The dirt was blowing because much of the vegetation had been burnt off. It was almost a solid wall of dirt and it didn’t seem like lights helped me to see. It was at this point that Vicki said, “I am so glad you came with me. I would have just had to pull off and waited until it cleared a little.” As I thought about that I was glad that I had gone with her. She wouldn’t have been safe just pulling off anywhere. Of course after we passed that point the smoke was behind us, the dirt was no longer pelting the car and the sky began to clear. We drove on only having to battle the strong winds. They were still blowing the trucks around and even moved us at times. When we turned off at McLean, Vicki said, “Now at least we’ll be driving straight into the wind and it won’t be so tough.” Well part of what she said was true. It was still a tough drive all the way into Pampa. As I thought about the wind, I thought about how the wind does take certain things and move them to where they are out of the way. While the wind is something that can cause us issues, it is also something that can bring a movement that truly helps us. 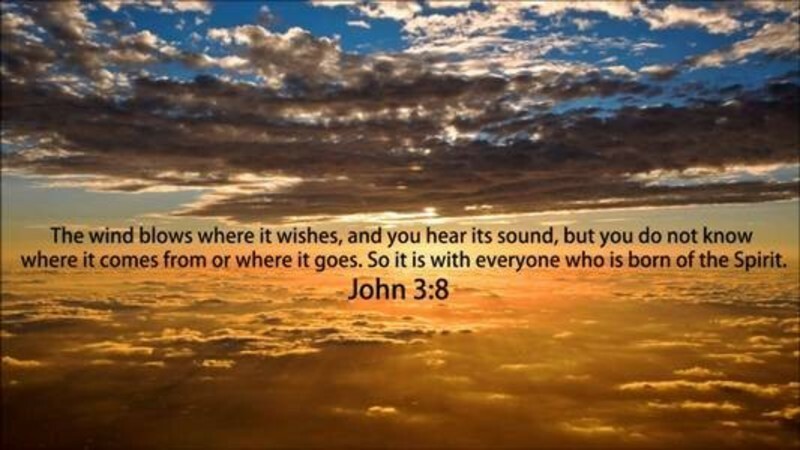 Wind is mentioned all through Scripture, but my mind turned to John 3 where Jesus is talking about being born again. He said that ‘unless one is born of the water and the spirit, he cannot enter into the kingdom of God’. (Jn. 3:5). He said in v.7 – “do not marvel that I said to you, ‘You must be born from above (again)’. It was then that He said – “The wind blows where it wishes and you hear the sound of it, but do not know where it comes from and where it is going; so is everyone who is born of the Spirit.” (Jn. 3:8). It is as the wind of Holy Spirit blows over us that we can find life in Christ. As the wind of Holy Spirit blows we may not fully understand all that is taking place, but we know that God is reaching out to us through the death and resurrection of Jesus Christ. (Jn. 3:14-15). The winds have been blowing across the panhandle in recent days there is no doubt. The fires have burned thousands of acres. We may question what is going on, but we must trust that God is still moving among us. The wind of Holy Spirit is still blowing over us revealing the hand of God as He reaches out to us to bring life. The next time you feel the wind blowing, just remember that it may well be God speaking to you concerning the life He offers through Jesus. As the wind blows don’t forget to pray for rain and for all who fight the fires.